Newswire: A Great Casita Maria Experience = 1 Workshop + 1 Performance in 1 Day! 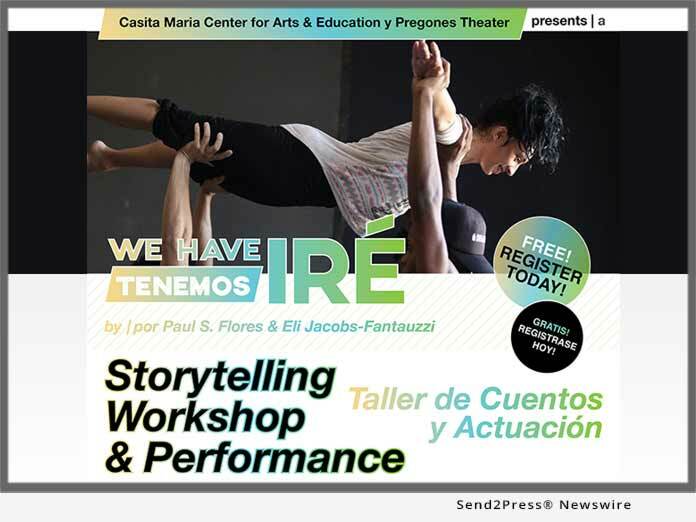 BRONX, N.Y., Feb. 11, 2019 (SEND2PRESS NEWSWIRE) -- Casita Maria Center for Arts & Education, in partnership with Pregones Theater, is proud to present "We Have Ire," a free excerpt performance of the multi-disciplinary theater project, on March 9, 2019, 2 - 2:45 p.m. The Casita Maria Gallery is a powerful teaching tool and welcoming space of cultural celebration (BRONX, N.Y.) -- NEWS: Casita Maria Center for Arts & Education, in partnership with Pregones Theater, is proud to present "We Have Ire," a free excerpt performance of the multi-disciplinary theater project, on March 9, 2019, 2 - 2:45 p.m.
Rock Dance Demo at Step Ya Game Up! Related Videos On: Rock Dance Demo at Step Ya Game Up!